We also offer smaller vans for groups up to 14 or medium size buses up to 25 as well as the big motor coaches. Again, you must rent the entire bus, we do not offer single rides. Big Bear, it is yours to take you where you want to go. Now that's service. We get a lot of calls about rides for single riders, or to be picked up at the neighboring airports, Ontario or Palm Springs. We do not have any information on single rider rides from these airports to Big Bear. Call the Chamber of Commerce in Big Bear. 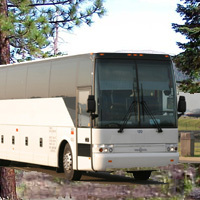 Big Bear bus trips get your group to Snow Summit or Bear Mountain on your schedule. We have run custom trips for groups such as the Malibu School systems, private parties, fraternities and sorority retreat camps and weddings. Call us and find out the cost to get your entire group to Big Bear. Leave the driving to us.